"Of all the forms of government, aside from direct democracy, representative democracy is a fair form of governance, especially when considering the alternatives that have proven disastrous for humanity throughout world history. The Classical Greek philosopher Plato identified five types of what he called regimes that should encourage adherence to some type of democratic government for the sake of a nation’s people. There are still governments controlled by aristocracy, theocracy, oligarchy, and tyranny, but those countries’ populations certainly are not free in the sense Americans are, and it is one of the detriments on not living in a country with secular humanistic tendencies inherent in a civilized democratic society. There is a growing number of Americans so dissatisfied living in a civilized society governed by a representative democracy, that they have begun threatening civil war and a revolution to transform American governance into a combination of Plato’s four deleterious regimes. The latest violent threats notwithstanding, the civil war and revolution have been under way for four years next week in Washington D.C.
'it’s usually been the rule if the president is going to be in charge of the government, we have to give him the people he wants to run it,' McCain said it was because the President did not ask Republicans 'what do you think about it.' McCain revealed in one statement that the GOP considers themselves the ruling party controlling the government regardless the results of the election, and in conjunction with their deliberate obstructionism, explains their every action over the past four years. "Last year when Republicans could not impose their Draconian budget and give more entitlements to the wealthy, they threatened to shut down the government and caused the nation’s first credit downgrade to impress upon the President, and the American people, that either they ruled America, or America suffered. 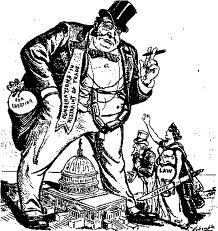 They are still revolting and threatening credit default and government shutdown if they cannot impose their austerity economics on the people, and appear more than willingly to destroy the economy if they are not allowed to rule because they have left no room for compromise necessary in a representative democracy. "They have warned the President that if their severe cuts to social safety nets are not enacted, they will hold the full faith and credit of the U.S. hostage, bringing the economy and government to a disastrous end. It is a dying tyrant’s modus operandi that if they cannot rule by unquestioned edict, they will take the country down; that is how much they despise representative democracy. "There have already been Republican threats to repeal the voting rights act, repeal most of the 14th Amendment to ensure neo-conservatives rule by corporate and theological edict, and are already preparing to rig the vote(Electoral College) to assure they regain control of the White House. It is abundantly clear that Republicans have no interest in participating in governance or governing in a representative democracy, only ruling by representative oligarchy. 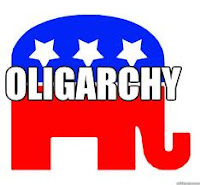 Although Republicans are elected as representatives of the people, they have represented an oligarchy led by the Koch Brothers, Wall Street, and big business that funds and incites religious fanatics, false-patriots, and conspiracy devotees as a grass roots front group for the oligarchs. "Republicans serving a small class of oligarchs have become the ultimate expression of Iran’s ruling theocracy and nothing close to representative democracy. 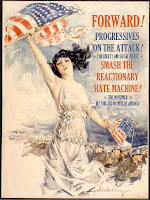 Regardless that in the last election their agenda was soundly defeated, they immediately proposed the same agenda by attempting to defund Planned Parenthood, impose austerity, introduce personhood legislation, attack environmental regulations, and continue obstructing any nominee, legislation, program, or economic agenda proposed by the President. "It is the dreaded tyranny Republicans and teabaggers claim President Obama is guilty of, and their cherished real American ideals, religious liberty, political freedom, and personal liberty are facing more vicious, sustained attacks by corporate-funded oligarchs in the Republican Party. There are opinions that the GOP is pandering exclusively to the whims and edicts of religious fanatics, patriarchal ruling class, corporate leaders, and the financial world who, not being duly elected representatives of the people, wield undue influence and power on their lackeys in the Republican Party, but they are willing representatives fulfilling a 75 year dream of undoing all of the New Deal’s programs and protections. "America is in a civil war and Republicans are rebelling against government by representative democracy. They have no intention of governing and if they have to bring America to its knees in their power grab to rule by oligarchy, they will either rule, or break the government. There has been overt tyranny in Washington for the past four years and it is the Republican Party. They are unwilling and unable to abandon their dreams of oligarchy and participate in governing this country evidenced by their obstructionism and attempts to subvert the Constitution. They have rejected the results of two elections, the will of the American people, and the very tenets that governed this nation for 232 years in their drive to rule by corporate and theocratic edict as they drive to destroy America’s representative democracy that informs they are the only tyrants in America." This essay proclaims part of the raison de e'tre for this site as it shows how the Conservatives under the guise of the GOP have fired the first shot in the Class War, and that "America is in a civil war (with) Republicans...rebelling against government by representative democracy. The only part missing is the obvious conclusion: that all acts of Conservatism are illegal acts, that Conservatism is inimical to our representative democracy, and therefore should be criminalized. Given the premise of the article, how can we deduce anything else? 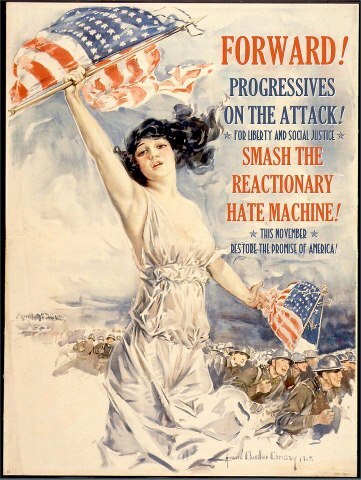 If "...Republicans are rebelling against government by representative democracy," if they are indeed "serving a small class of oligarchs," then they must by extension be guilty of anti-Americanism and should be ostracized from our system of government and their leaders made to pay for their crimes, and their followers re-educated before allowed to participate in the political arena again.